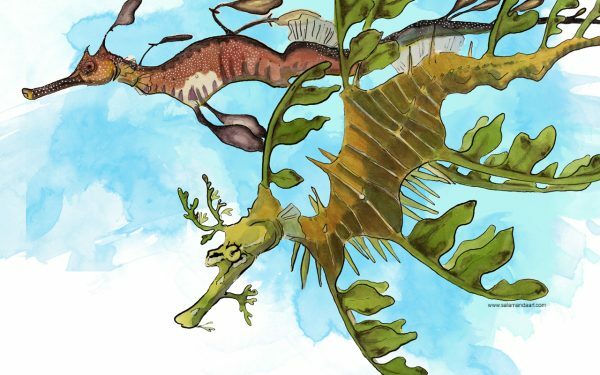 There are two kinds of seadragons native in the waters around Australia; the Weedy and the Leafy. In this illustration I’ve placed them in an ocean race. Who will win? This illustration was done in pen and ink with watercolor. It is one of the images I have done for a book I’m working on called “Seahorses and their Kin” which I hope to publish soon. Check out more images in my gallery! Thanks for stopping by! Amanda Zimmerman is a published illustrator interested in visually documenting your story. Much of her work reflects her love for nature; morphing from realistic to fanciful as … Show more. Send a message directly to Amanda Zimmerman. “"..., I have been extremely pleased with my interactions with Amanda. Not only is she competent in her field, she is also a person with an easygoing personality who can help bridge the scientific insight of the scientist with the artistic eye of the artist. She is able to imaging what I wanted to accomplish and then deliver a quality product. " Amanda Zimmerman is a published illustrator interested in visually documenting your story. Much of her work reflects her love for nature; morphing from realistic to fanciful as needed. She would love to work on a series of spot illustrations for a YA chapter books. As a former Art Director for a bicycling magazine; she is mindful of schedules and deadlines. She is always open to feedback from the client. She is a member of Society of Children’s Book Writers and Illustrators, Pittsburgh Society of Illustrators and the Guild of Natural Scientific Illustrators. Explore her body of work at www.salamandaart.com.